Siargao is a small island in Surigao del Norte, Philippines which is considered a paradise to those who have stepped foot on it, and of course the surfing capital in the country where you can find the famed barrels. The island is a smorgasbord of adventures. It's full of charm that all travelers spend days, weeks or months in the island. Some even left their countries and migrate there. Please read my other Siargao story here. We went there by plane - the fastest way to get into the island. From Cebu we flied for almost an hour. Cebu Pacific flies thrice a week from Cebu to Sayak airport in Siargao, which is an hour away from General Luna, where Cloud 9 and other resorts are located. My tip is to plan your trip ahead of time and score a seat sale to spend less on airfare. You can aslo travel by boat through Cokaliong Shippings to Surigao City, and another boat from Surigao to Dapa, Siargao. From Sayak airport, we were lucky enough to be fetched by the owner of Aventino's Pizza, whose son was a friend of ours. (Hi Mike!) But there are vans and motorbikes lined up outside the airport that will take you to General Luna. Below are our agenda each day during our 5N6D-trip to the island. Please take note that the currency of the expenses written below are in Philippine Peso. After arriving at the airport, we had the best pizza in town for lunch at Aventino's, rented a motorbike for 500php a day, checked into Wave Cave and drove to Magpupungko in Pilar which is an hour away from General Luna. We were told that the best time to go to the Rock Pools is during low tide and after checking in at Wave Cave at 3pm, we had a tip that it's a good time to go. We arrived at 4pm but we only got to spend an hour there for high tide and dark skies were settling in. 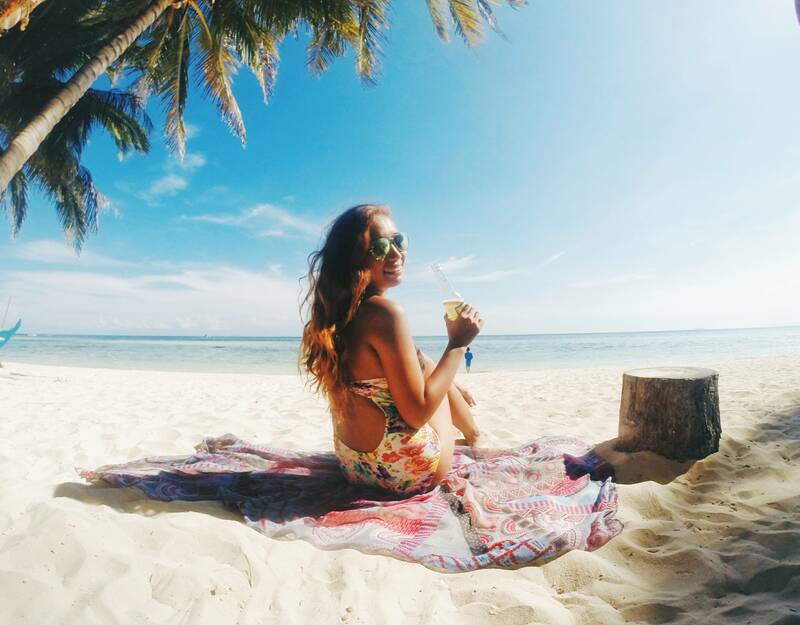 It was my most favorite destination in Siargao! It's already dark on our way back to GL with no lamp post in sight when we had a flat tire. Thank God there were good-hearted locals who led us to the nearest vulcanizing shop. When we arrived we had dinner at a barbecue store near the church in GL and went to Baile, then Jungle Disco, which is the ultimate party place in the island and went home by 3am. We had a mistake here. It was a wrong move to go surfing after getting intoxicated from last night's shenanigans. So we ended up surfing the Pacific waves with a hangover but we're still able to enjoy our first surfing experience at the country's surfing capital. We rented surfboards at a funny-named store, Very Good Nice just across Cloud 9. It's 500/hr, 200 for the board and 300 for the instructor. We had some refreshments at Ocean 101 after and went resort hopping, went back to Aventino's to have pizzas for lunch (it's that addicting) and rested for the rest of the day. After packing our things and transferring from Wave Cave to Aventino's, we met up with my boyfriend's two other friends at the market in GL (where the boats for island hopping can be found) to save from the boat rental so there are already 5 of us for the 1500.00 fee. We bought rice, raw fish, pork, fruits, ice, charcoals, water and everything we needed for the island hopping in the market before leaving. We sailed to Naked first, then to Daku and lastly to Guyam. We stayed longer in Daku, the biggest islet among the three and had our lunch there. Our boatmen suggested which hut we'll rent and that the owner will prepare our foods. If you're not into surfing and just wanted to go beaching, you'll surely love these islets! The sands are so fine, white and clean! After the island hopping, we rested, had dinner and went to Chill Out for the acoustic night under a blanket of stars. Since the main reason we went here is to surf, we decided to surf all we want on our fourth day. Most of each day's destinations are actually spontaneous. We just aimed to be productive every single day on our slow-paced days in this island. Since I brought a borrowed surfboard all the way from Cebu, we decided to cease on renting a board for my boyfriend and friend and just share the one I brought and just hire an instructor instead. We just agreed to take turns every after 5 rides, which was funny but actually satisfying and not too tiring. We ended up surfing longer and spending less. The original plan was to go to Sugba Lagoon at Caub in the town of Del Carmen, almost two hours of motorbike ride from GL but unfortunately, it was damaged by a typhoon and their tourism staffs were currently rebuilding it when we went there. So we ended up sailing to Midway Island instead. Del Carmen has a lot of lagoons with Emerald-like water that's so clear, and is a home for different kinds of endangered species. On the other hand, Midway Island is worth the visit. We had the clear and warm water all to ourselves and we were definitely refreshed after that island trip. Will blog about Midway Island alone soon. After the quick trip to Caub, we've gone surfing at Jacking Horse until sundown to savor the remaining days of our surf trip and stuffed ourselves some pizza. On our last day, we woke up early in the morning and headed to Jacking Horse to get stoked with our local friend, Balong. We had our last bites of Aventino's pizza after (had it everyday lol), packed and bid farewell to this island paradise. On our first two nights, we stayed in Wave Cave, a few blocks away from the church in GL because the rooms in Aventino's were currently fully booked. We only paid 700php per night for an air conditioned room with a king size bed, and a CR inside. The place also had a bar above where you can chill or read a book. It's quite far from Cloud 9 but it has a quick access to the market where we rented our boat for the island hopping. On our 3rd night, we transferred to Aventino's which was located just across the church. 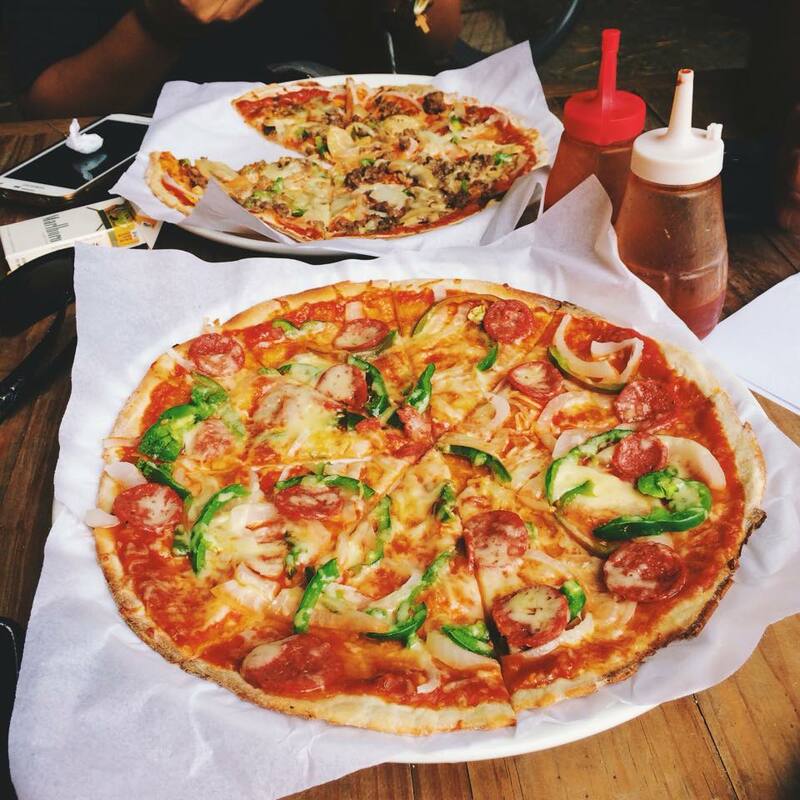 We had a great time there with the pizza just in front of our doorstep! Imagine yourself waking up to the smell of yummy pizza! We actually had pizza mostly for lunch and dinner and we still couldn't get enough of it! The rooms are also affordable with an air condition, a CR inside and two single beds for 660.00php per night. The places we stayed at were in GL proper which is minutes away from Coud 9 but we rented a motorbike with a board holder throughout our stay so that we can easily go to the places we wanted to with less hassle. Just make sure to have a license with you because according to our local friends, despite the size of the island, their LTO officers are strict. Our budget for this trip was roughly around 10,000.00php including the airfare. I hope this could help you get tips and ideas on your trip to Siargao, in time for the upcoming International Surfing Festival this last week of September. Happy travels!